Saturdays are meant for sleeping in, but this week I managed to get 3 other people up and at ‘em by 10:00 AM! Melibu, Vanessa and veteran farmers’ market attendee Squiggy met me at one of the many awesome farmers’ markets mentioned in the Grid article earlier last week. As I have mentioned before, the Stop Farmers’ Market is one of my favourite markets and I always find something cool and yummy to bring home. 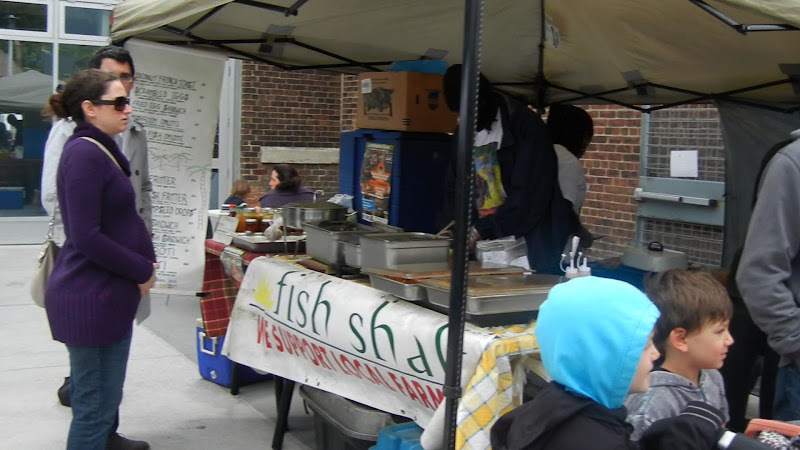 It is run by the Stop Community Food Centre which is located in the lovely and arty Wychwood Barns. The Wychwood Barns were originally created as a maintenance facility for streetcars back in the 1913 and on for several decades. Having one final facelift in 2004, its current state is everything from an arts space, a community centre, a recreational park to, most importantly, a refuge for many community based initiatives. A little bit of old and new mixed together for all those young and old hearts to enjoy. It everything and anything it needs to be for the times, and I hope that it never changes. After our first stop (COFFEE. 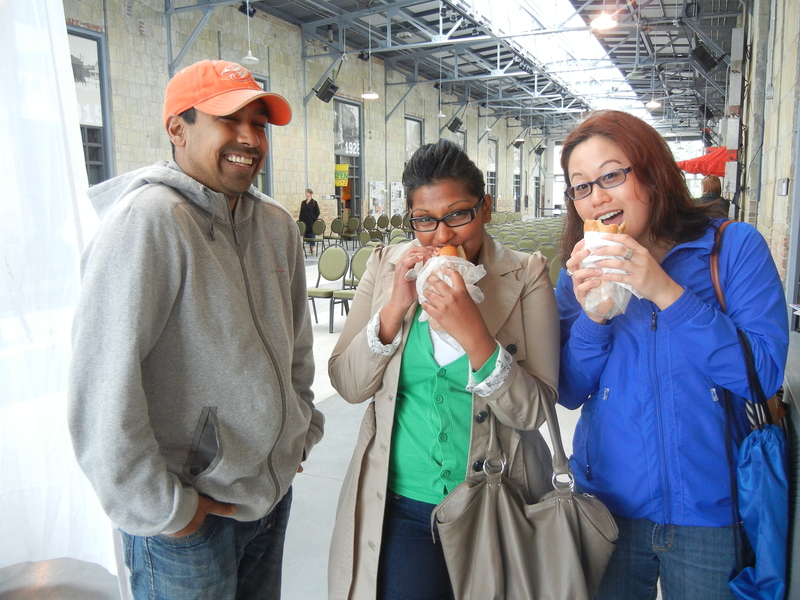 Amazing Coffee…), we had a little something to eat from an authentic Carribean fish shack. 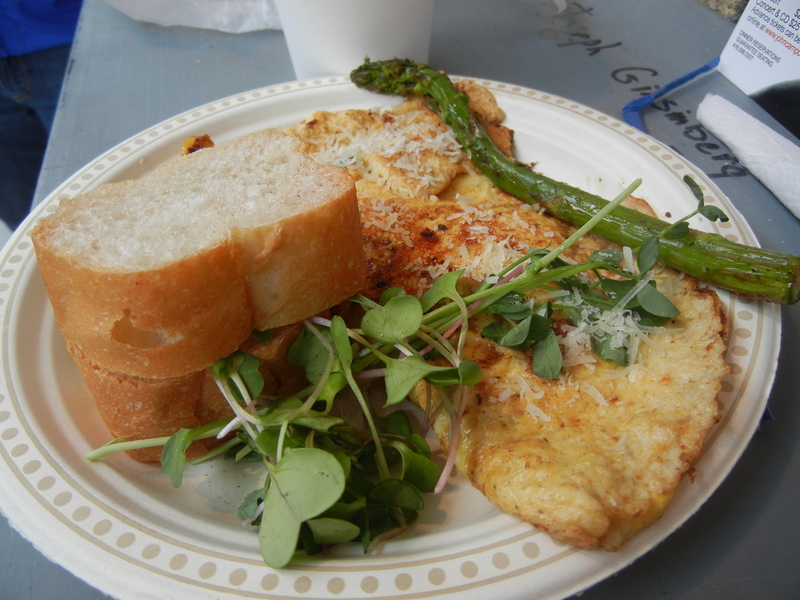 I was in a breakfast-y mood and opted for the smoked fish omelette (pictured above). My meal was filling and perfect: an omelette full of smoked fish, mushrooms and the right amount of real parmesan sprinkled on top. 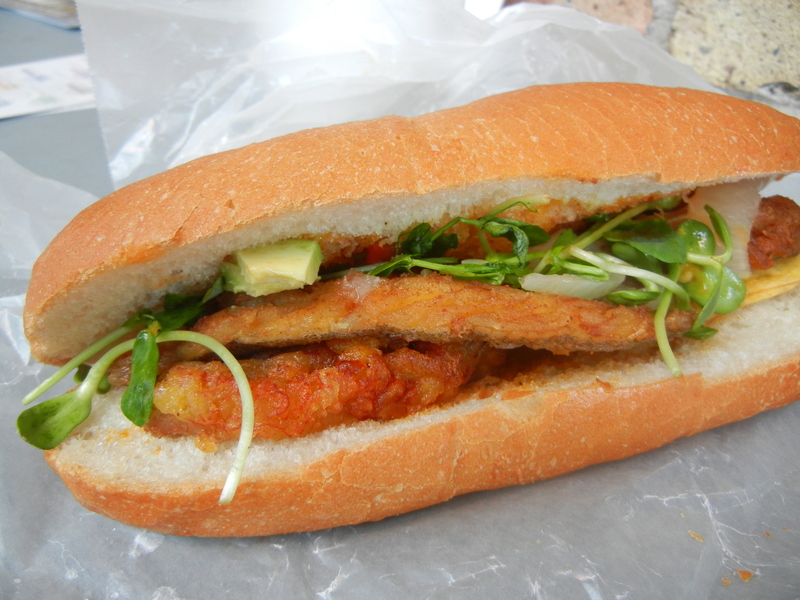 Melibu and Vanessa picked up a butterfish sandwich with pickled onion, avocado, plantain, hot sauce and pepper pesto. 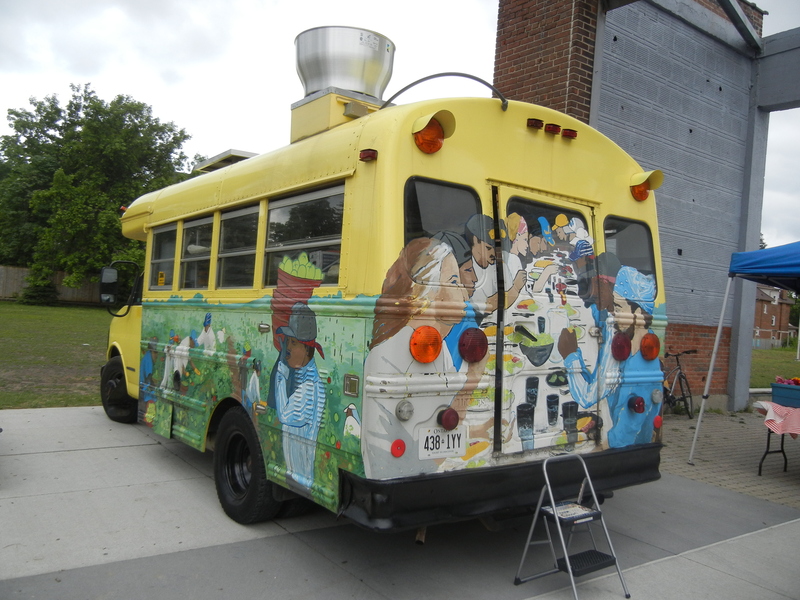 Both girls said their sandwiches hit the spot and were absolutely delish. Since I went through what we picked up at the market in my video let me just show you a meal I had tonight where I used all 3 things I purchased! 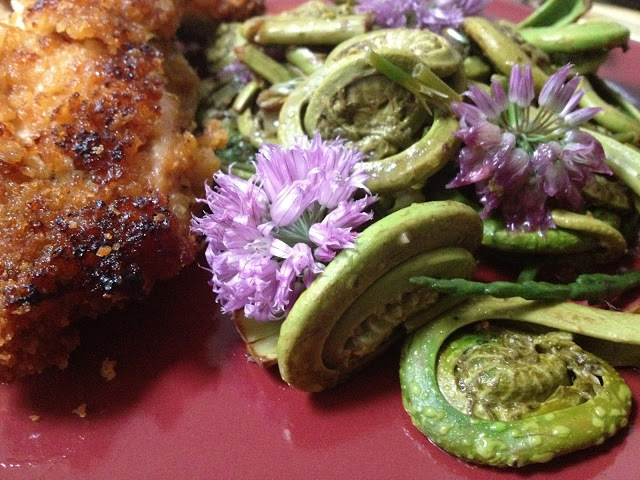 I made a Fiddlehead Stirfry with Salicornia and Chive drenched in butter. I squeezed a bit of lemon into it and it went amazing beside some country chicken leftovers. The fiddleheads were a little overdone because I was scared I didn’t blanch them enough but they were still delicious! These veggies make me look like I know how to cook! 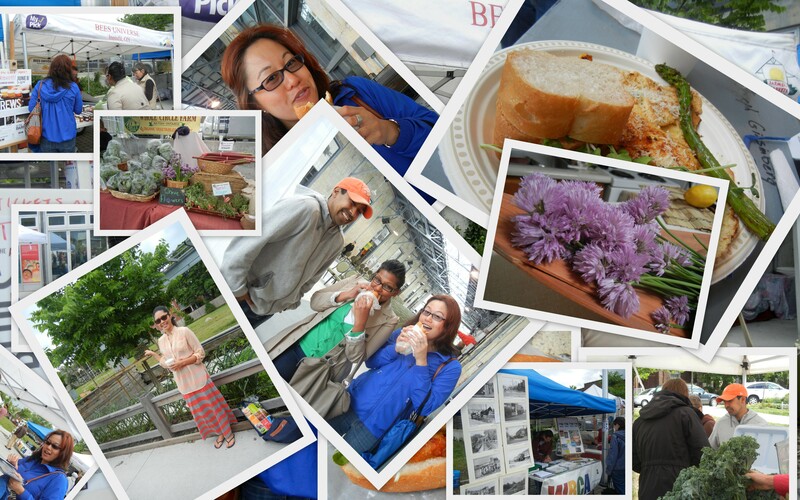 All in all, we had an amazing experience at the farmers’ market. I think the best moment we had going exploring was when Squiggy turned around and said to me “this kind of thing makes me feel good about community”. He’s right. Being in that space, surrounded by the evidence of their hard work, it’s hard to pretend that it’s anything but a powerful reminder of what a community can do when it puts it’s mind and heart into it. V, Squiggy and Melissa enjoying their Breakfast! For more information and how to get involved with the Stop click here. A video on our trip can be found here. Happy Brunching!